27 After this he went out, and saw a tax collector, named Levi, sitting at the tax office; and he said to him, “Follow me.” 28 And he left everything, and rose and followed him. While the people pressed upon him to hear the word of God, he was standing by the lake of Gennes′aret. 2 And he saw two boats by the lake; but the fishermen had gone out of them and were washing their nets. 3 Getting into one of the boats, which was Simon’s, he asked him to put out a little from the land. And he sat down and taught the people from the boat. 4 And when he had ceased speaking, he said to Simon, “Put out into the deep and let down your nets for a catch.” 5 And Simon answered, “Master, we toiled all night and took nothing! But at your word I will let down the nets.” 6 And when they had done this, they enclosed a great shoal of fish; and as their nets were breaking, 7 they beckoned to their partners in the other boat to come and help them. And they came and filled both the boats, so that they began to sink. 8 But when Simon Peter saw it, he fell down at Jesus’ knees, saying, “Depart from me, for I am a sinful man, O Lord.” 9 For he was astonished, and all that were with him, at the catch of fish which they had taken; 10 and so also were James and John, sons of Zeb′edee, who were partners with Simon. And Jesus said to Simon, “Do not be afraid; henceforth you will be catching men.” 11 And when they had brought their boats to land, they left everything and followed him. Here we have a woman with a hemorrhage, which would have made her ritually unclean under Jewish law, seeking to touch Jesus. This would have made him also unclean under Jewish law. Yet she tries to touch him anyways. The interesting question is, does this make her a worse person than Peter? After all, Peter (if I read the prior situation right) didn’t want to make Jesus unclean, seemingly out of concern for Jesus. Here the woman seems concerned only for herself. Yet at the same time there is an argument that it is the woman who is in the right. She, after all, has faith in Jesus. She has faith that merely touching him will make her clean. Faith that what is holy can in her case, and perhaps all cases, overcome what is unholy. Is not a view such as this a more honorable one? Does it not give the greater power to God- to make clean that which is unclean, merely by the presence of holiness? Once again, I’m curious what the Church fathers and saints taught about this, plus my readers, of course. St. John Chrysostom, in his homilies on the Gospel of St. Matthew, offers his take here. 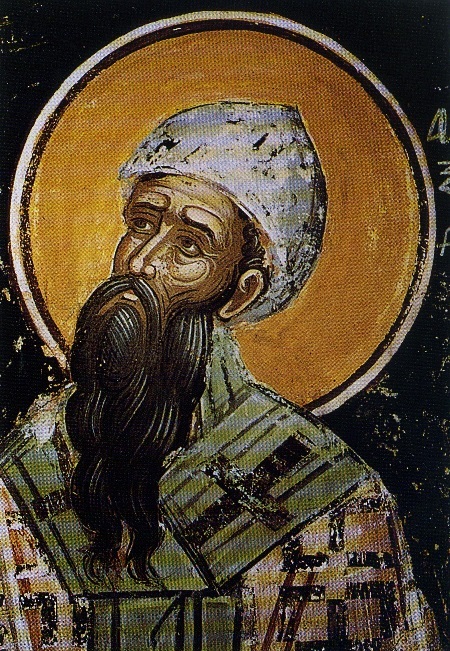 Cyril of Alexandria (Greek: Κύριλλος Ἀλεξανδρείας; c. 376 – 444) was the Patriarch of Alexandria from 412 to 444. He was enthroned when the city was at the height of its influence and power within the Roman Empire. Cyril wrote extensively and was a leading protagonist in the Christological controversies of the later 4th and 5th centuries. He was a central figure in the First Council of Ephesus in 431, which led to the deposition of Nestorius as Patriarch of Constantinople. Cyril is well-known due to his dispute with Nestorius and his supporter Patriarch John of Antioch, whom Cyril excluded from the Council of Ephesus for arriving late. He is also known for his expulsion of Novatians and Jews from Alexandria and for inflaming tensions that led to the murder of the Hellenistic philosopher Hypatia by a Christian mob. Historians disagree over the extent of his responsibility for these events. The Roman Catholic Church did not commemorate Saint Cyril in the Tridentine Calendar: it added his feast only in 1882, assigning to it the date of 9 February. The 1969 revision moved it to 27 June, considered to be the day of the saint’s death, as celebrated by the Coptic Orthodox Church. The same date has been chosen for the Lutheran calendar. The Eastern Orthodox Church and Eastern Catholic Church celebrate his feast day on 9 June and also, together with Pope Athanasius I of Alexandria, on 18 January. 16. But it is impossible, some one will say, that the dead should rise; and yet Eliseus twice raised the dead—when he was alive, and also when dead. Do we then believe, that when Eliseus was dead, a dead man who was cast upon him and touched him, arose and is Christ not risen? But in that case, the dead man who touched Eliseus, arose, yet he who raised him continued nevertheless dead: but in this case both the Dead of whom we speak Himself arose, and many dead were raised without having even touched Him. For many bodies of the Saints which slept arose, and they came out of the graves after His Resurrection, and went into the Holy City Matthew 27:52-53, (evidently this city, in which we now are ,) and appeared unto many. Eliseus then raised a dead man, but he conquered not the world; Elias raised a dead man, but devils are not driven away in the name of Elias. We are not speaking evil of the Prophets, but we are celebrating their Master more highly; for we do not exalt our own wonders by disparaging theirs; for theirs also are ours; but by what happened among them, we win credence for our own. 17. But again they say, A corpse then lately dead was raised by the living; but show us that one three days dead can possibly arise, and that a man should be buried, and rise after three days. If we seek for Scripture testimony in proof of such facts, the Lord Jesus Christ Himself supplies it in the Gospels, saying, For as Jonas was three days and three nights in the whale’s belly; so shall the Son of man be three days and three nights in the heart of the earth. Matthew 12:40 And when we examine the story of Jonas, great is the force of the resemblance. Jesus was sent to preach repentance; Jonas also was sent: but whereas the one fled, not knowing what should come to pass; the other came willingly, to give repentance unto salvation. Jonas was asleep in the ship, and snoring amidst the stormy sea; while Jesus also slept, the sea, according to God’s providence , began to rise, to show in the sequel the might of Him who slept. To the one they said, Why are you snoring? Arise, call upon your God, that God may save us Jonah 1:6; but in the other case they say unto the Master, Lord, save us. Matthew 8:25-26 Then they said, Call upon your God; here they say, save Thou. But the one says, Take me, and cast me into the sea; so shall the sea be calm unto you Jonah 1:12; the other, Himself rebuked the winds and the sea, and there was a great calm. Matthew 8:25-26 The one was cast into a whale’s belly: but the other of His own accord went down there, where the invisible whale of death is. And He went down of His own accord, that death might cast up those whom he had devoured, according to that which is written, I will ransom them from the power of the grave; and from the hand of death I will redeem them Hosea 13:14 . 18. At this point of our discourse, let us consider whether is harder, for a man after having been buried to rise again from the earth, or for a man in the belly of a whale, having come into the great heat of a living creature, to escape corruption. For what man knows not, that the heat of the belly is so great, that even bones which have been swallowed moulder away? How then did Jonas, who was three days and three nights in the whale’s belly, escape corruption? And, seeing that the nature of all men is such that we cannot live without breathing, as we do, in air, how did he live without a breath of this air for three days? But the Jews make answer and say, The power of God descended with Jonas when he was tossed about in hell. Does then the Lord grant life to His own servant, by sending His power with him, and can He not grant it to Himself as well? If that is credible, this is credible also; if this is incredible, that also is incredible. For to me both are alike worthy of credence. I believe that Jonas was preserved, for all things are possible with God Matthew 19:26; I believe that Christ also was raised from the dead; for I have many testimonies of this, both from the Divine Scriptures, and from the operative power even at this day of Him who arose—who descended into hell alone, but ascended thence with a great company; for He went down to death, and many bodies of the saints which slept arose Matthew 27:52 through Him. 19. Death was struck with dismay on beholding a new visitant descend into Hades, not bound by the chains of that place. Why, O porters of Hades, were you scared at sight of Him? What was the unwonted fear that possessed you? Death fled, and his flight betrayed his cowardice. The holy prophets ran unto Him, and Moses the Lawgiver, and Abraham, and Isaac, and Jacob; David also, and Samuel, and Esaias, and John the Baptist, who bore witness when he asked, Are You He that should come, or look we for another Matthew 11:3? All the Just were ransomed, whom death had swallowed; for it behooved the King whom they had proclaimed, to become the redeemer of His noble heralds. Then each of the Just said, O death, where is your victory? O grave, where is your sting ? For the Conqueror has redeemed us. 20. Of this our Saviour the Prophet Jonas formed the type, when he prayed out of the belly of the whale, and said, I cried in my affliction, and so on; out of the belly of hell Jonah 2:2, and yet he was in the whale; but though in the whale, he says that he is in Hades; for he was a type of Christ, who was to descend into Hades. And after a few words, he says, in the person of Christ, prophesying most clearly, My head went down to the chasms of the mountains ; and yet he was in the belly of the whale. What mountains then encompass you? I know, he says, that I am a type of Him, who is to be laid in the Sepulchre hewn out of the rock. And though he was in the sea, Jonas says, I went down to the earth, since he was a type of Christ, who went down into the heart of the earth. And foreseeing the deeds of the Jews who persuaded the soldiers to lie, and told them, Say that they stole Him away, he says, By regarding lying vanities they forsook their own mercy. Jonah 2:8 For He who had mercy on them came, and was crucified, and rose again, giving His own precious blood both for Jews and Gentiles; yet say they, Say that they stole Him away, having regard to lying vanities. But concerning His Resurrection, Esaias also says, He who brought up from the earth the great Shepherd of the sheep ; he added the word, great, lest He should be thought on a level with the shepherds who had gone before Him. 21. Since then we have the prophecies, let faith abide with us. Let them fall who fall through unbelief, since they so will; but you have taken your stand on the rock of the faith in the Resurrection. Let no heretic ever persuade you to speak evil of the Resurrection. For to this day the Manichees say, that, the resurrection of the Saviour was phantom-wise, and not real, not heeding Paul who says, Who was made of the seed of David according to the flesh; and again, By the resurrection of Jesus Christ our Lord from the dead. And again he aims at them, and speaks thus, Say not in your heart, who shall ascend into heaven; or who shall descend into the deep? That is, to bring up Christ from the dead Romans 10:6-7; and in like manner warning as he has elsewhere written again, Remember Jesus Christ raised from the dead 2 Timothy 2:8; and again, And if Christ be not risen, then is our preaching vain, and your faith also vain. Yea, and we are found false witnesses of God; because we testified of God that He raised up Christ, whom He raised not up. 1 Corinthians 15:14-15 But in what follows he says, But now is Christ risen from the dead, the first fruits of them that are asleep 1 Corinthians 15:20; — And He was seen of Cephas, then of the twelve; (for if you believe not the one witness, you have twelve witnesses;) then He was seen of above five hundred brethren at once 1 Corinthians 15:5-6; (if they disbelieve the twelve, let them admit the five hundred;) after that He was seen of James , His own brother, and first Bishop of this diocese. Seeing then that such a Bishop originally saw Christ Jesus when risen, do not thou, his disciple, disbelieve him. But you say that His brother James was a partial witness; afterwards He was seen also of me 1 Corinthians 15:8 Paul, His enemy; and what testimony is doubted, when an enemy proclaims it? I, who was before a persecutor 1 Timothy 1:13, now preach the glad tidings of the Resurrection. 22. Many witnesses there are of the Saviour’s resurrection.— The night, and the light of the full moon; (for that night was the sixteenth ) the rock of the sepulchre which received Him; the stone also shall rise up against the face of the Jews, for it saw the Lord; even the stone which was then rolled away , itself bears witness to the Resurrection, lying there to this day. Angels of God who were present testified of the Resurrection of the Only-begotten: Peter and John, and Thomas, and all the rest of the Apostles; some of whom ran to the sepulchre, and saw the burial-clothes, in which He was wrapped before, lying there after the Resurrection; and others handled His hands and His feet, and beheld the prints of the nails; and all enjoyed together that Breath of the Saviour, and were counted worthy to forgive sins in the power of the Holy Ghost. Women too were witnesses, who took hold of His feet, and who beheld the mighty earthquake, and the radiance of the Angel who stood by: the linen clothes also which were wrapped about Him, and which He left when He rose—the soldiers, and the money given to them; the spot itself also, yet to be seen—and this house of the holy Church, which out of the loving affection to Christ of the Emperor Constantine of blessed memory, was both built and beautified as you see. 23. A witness to the resurrection of Jesus is Tabitha also, who was in His name raised from the dead Acts 9:41; for how shall we disbelieve that Christ is risen, when even His Name raised the dead? The sea also bears witness to the resurrection of Jesus, as you have heard before. The drought of fishes also testifies, and the fire of coals there, and the fish laid thereon. Peter also bears witness, who had erst denied Him thrice, and who then thrice confessed Him; and was commanded to feed His spiritual sheep. To this day stands Mount Olivet, still to the eyes of the faithful all but displaying Him Who ascended on a cloud, and the heavenly gate of His ascension. For from heaven He descended to Bethlehem, but to heaven He ascended from the Mount of Olives ; at the former place beginning His conflicts among men, but in the latter, crowned after them. You have therefore many witnesses; you have this very place of the Resurrection; you have also the place of the Ascension towards the east; you have also for witnesses the Angels which there bore testimony; and the cloud on which He went up, and the disciples who came down from that place. 24. The course of instruction in the Faith would lead me to speak of the Ascension also; but the grace of God so ordered it, that you heard most fully concerning it, as far as our weakness allowed, yesterday, on the Lord’s day; since, by the providence of divine grace, the course of the Lessons in Church included the account of our Saviour’s going up into the heavens ; and what was then said was spoken principally for the sake of all, and for the assembled body of the faithful, yet especially for your sake. But the question is, did you attend to what was said? For you know that the words which come next in the Creed teach you to believe in Him Who rose again the third day, and ascended into Heaven, and sat down on the right hand of the Father. I suppose then certainly that you remember the exposition; yet I will now again cursorily put you in mind of what was then said. Remember what is distinctly written in the Psalms, God is gone up with a shout ; remember that the divine powers also said to one another, Lift up your gates, you Princes , and the rest; remember also the Psalm which says, He ascended on high, He led captivity captive ; remember the Prophet who said, Who builds His ascension unto heaven ; and all the other particulars mentioned yesterday because of the gainsaying of the Jews. 25. For when they speak against the ascension of the Saviour, as being impossible, remember the account of the carrying away of Habakkuk: for if Habakkuk was transported by an Angel, being carried by the hair of his head , much rather was the Lord of both Prophets and Angels, able by His own power to make His ascent into the Heavens on a cloud from the Mount of Olives. Wonders like this you may call to mind, but reserve the preeminence for the Lord, the Worker of wonders; for the others were borne up, but He bears up all things. Remember that Enoch was translated Hebrews 11:5; but Jesus ascended: remember what was said yesterday concerning Elias, that Elias was taken up in a chariot of fire 2 Kings 2:11; but that the chariots of Christ are ten thousand-fold even thousands upon thousands : and that Elias was taken up, towards the east of Jordan; but that Christ ascended at the east of the brook Cedron: and that Elias went as into heaven ; but Jesus, into heaven: and that Elias said that a double portion in the Holy Spirit should be given to his holy disciple; but that Christ granted to His own disciples so great enjoyment of the grace of the Holy Ghost, as not only to have It in themselves, but also, by the laying on of their hands, to impart the fellowship of It to them who believed. 26. And when you have thus wrestled against the Jews—when you have worsted them by parallel instances, then come further to the pre-eminence of the Saviour’s glory; namely, that they were the servants, but He the Son of God. And thus you will be reminded of His pre-eminence, by the thought that a servant of Christ was caught up to the third heaven. For if Elias attained as far as the first heaven, but Paul as far as the third, the latter, therefore, has obtained a more honourable dignity. Be not ashamed of your Apostles; they are not inferior to Moses, nor second to the Prophets; but they are noble among the noble, yea, nobler still. For Elias truly was taken up into heaven; but Peter has the keys of the kingdom of heaven, having received the words, Whatsoever you shall loose on earth shall be loosed in heaven. Matthew 16:19 Elias was taken up only to heaven; but Paul both into heaven, and into paradise (for it behooved the disciples of Jesus to receive more manifold grace), and heard unspeakable words, which it is not lawful for man to utter. But Paul came down again from above, not because he was unworthy to abide in the third heaven, but in order that after having enjoyed things above man’s reach, and descended in honour, and having preached Christ, and died for His sake, he might receive also the crown of martyrdom. But I pass over the other parts of this argument, of which I spoke yesterday in the Lord’s-day congregation; for with understanding hearers, a mere reminder is sufficient for instruction. 27. But remember also what I have often said concerning the Son’s sitting at the right hand of the Father; because of the next sentence in the Creed, which says, and ascended into Heaven, and sat down at the right hand of the Father. Let us not curiously pry into what is properly meant by the throne; for it is incomprehensible: but neither let us endure those who falsely say, that it was after His Cross and Resurrection and Ascension into heaven, that the Son began to sit on the right hand of the Father. For the Son gained not His throne by advancement ; but throughout His being (and His being is by an eternal generation ) He also sits together with the Father. And this throne the Prophet Esaias having beheld before the incarnate coming of the Saviour, says, I saw the Lord sitting on a throne, high and lifted up Isaiah 6:1 , and the rest. For the Father no man has seen at any time John 1:18 , and He who then appeared to the Prophet was the Son. The Psalmist also says, Your throne is prepared of old; You are from everlasting . Though then the testimonies on this point are many, yet because of the lateness of the time, we will content ourselves even with these. 28. But now I must remind you of a few things out of many which are spoken concerning the Son’s sitting at the right hand of the Father. For the hundred and ninth Psalm says plainly, The Lord said unto my Lord, Sit on My right hand, until I make Your enemies Your footstool. And the Saviour, confirming this saying in the Gospels, says that David spoke not these things of himself, but from the inspiration of the Holy Ghost, saying, How then does David in the Spirit call Him Lord, saying, The Lord said unto my Lord, Sit on My right hand Matthew 22:43? And the rest. And in the Acts of the Apostles, Peter on the day of Pentecost standing with the Eleven Acts 2:34, and discoursing to the Israelites, has in very words cited this testimony from the hundred and ninth Psalm. 29. But I must remind you also of a few other testimonies in like manner concerning the Son’s sitting at the right hand of the Father. For in the Gospel according to Matthew it is written, Nevertheless, I say unto you, Henceforth you shall see the Son of Man sitting on the right hand of power Matthew 26:64, and the rest: in accordance with which the Apostle Peter also writes, By the Resurrection of Jesus Christ, who is on the right hand of God, having gone into heaven. 1 Peter 3:22 And the Apostle Paul, writing to the Romans, says, It is Christ that died, yea rather, that is risen again, who is even at the right hand of God. Romans 8:34 And charging the Ephesians, he thus speaks, According to the working of His mighty power, which He wrought in Christ when He raised Him from the dead, and set Him at His own right hand Ephesians 1:19-20; and the rest. And the Colossians he taught thus, If you then be risen with Christ, seek the things above, where Christ is seated at the right hand of God. Colossians 3:1 And in the Epistle to the Hebrews he says, When He had made purification of our sins, He sat down on the right hand of the Majesty on high. Hebrews 1:3 And again, But unto which of the Angels has He said at any time, Sit thou at My right hand, until I make your enemies your footstool ? And again, But He, when He had offered one sacrifice for all men, for ever sat down on the right hand of God; from henceforth expecting till His enemies be made His footstool. And again, Looking unto Jesus, the author and perfecter of our faith; Who for the joy that was set before Him endured the Cross, despising shame, and is set down on the right hand of the throne of God. 30. And though there are many other texts concerning the session of the Only-begotten on the right hand of God, yet these may suffice us at present; with a repetition of my remark, that it was not after His coming in the flesh that He obtained the dignity of this seat; no, for even before all ages, the Only-begotten Son of God, our Lord Jesus Christ, ever possesses the throne on the right hand of the Father. Now may He Himself, the God of all, who is Father of the Christ, and our Lord Jesus Christ, who came down, and ascended, and sits together with the Father, watch over your souls; keep unshaken and unchanged your hope in Him who rose again; raise you together with Him from your dead sins unto His heavenly gift; count you worthy to be caught up in the clouds, to meet the Lord in the air 1 Thessalonians 4:17, in His fitting time; and, until that time arrive of His glorious second advent, write all your names in the Book of the living, and having written them, never blot them out (for the names of many, who fall away, are blotted out); and may He grant to all of you to believe in Him who rose again, and to look for Him who is gone up, and is to come again, (to come, but not from the earth; for be on your guard, O man, because of the deceivers who are to come;) Who sits on high, and is here present together with us, beholding the order of each, and the steadfastness of his faith. Colossians 2:5 For think not that because He is now absent in the flesh, He is therefore absent also in the Spirit. He is here present in the midst of us, listening to what is said of Him, and beholding your inward thoughts, and trying the reins and hearts —who also is now ready to present those who are coming to baptism, and all of you, in the Holy Ghost to the Father, and to say, Behold, I and the children whom God has given Me :— To whom be glory for ever. Amen. A female reader of my blog reached out to me recently about an experience she had with online dating. She had met a Christian guy online, and they had gotten to talking about marriage back and forth for a while- a number of months. It had been going well and was getting serious- they were all set to meet, an important step since they lived far apart. Then the guy went silent. She didn’t hear from him for a month. None of her responses were answered. There had been no warning that he was going silent either. I suppose that it goes without saying that she was somewhat upset by this response. To put it mildly. Not only had he rejected her, and not only had he refused to give any real reason, he also pulled a LJBF on her. She contacted me to try and understand what was going on. She genuinely didn’t understand. To be honest, neither did I. His message was one that could only hurt her. It left most nearly everything up to her imagination, and her imagination took her dark places. I think that would be the case for most nearly any woman. She wondered if he had been playing with her all along, and pulled this stunt merely to mess with her. She wondered if he hadn’t found her attractive, and was merely using her for “relationship practice.” And of course, before she heard from him she wondered if something terrible had happened to him, and had worried greatly. I gathered from her that the guy in question had known she was at least somewhat emotionally attached to him. Apparently he even claimed to be considerate of women’s feelings. But his silence and his curt message refute his own assertions. This brings me to the central point of my post- if you are a guy and reject a woman, you owe her the truth. Tell her enough so that she won’t have good reason to wonder if it is a trick or if there is something wrong for her. Perhaps she will anyways, but at that point it is on her, not you. Remember that woman is the weaker vessel, and act accordingly. Be considerate of their feelings- clarifying matters for them is an act of charity. Unless there is a solid legal reason not to tell her, you should do so. Yes, even if it is embarrassing or shameful. Be a man and bite the bullet. That answer this woman received came across to me as very passive-aggressive, and frankly as a bit unmanly. Don’t repeat that. And while I’m at it, women owe men the truth as well. The present marriage marketplace is an utter mess. It won’t get any better if people employ rejections that lack all empathy for the other person. Tell other people as much as you can. It is the charitable thing to do. Update: The woman in question contacted me, and provided a few clarifications (I had misunderstood and misinterpreted her a bit, plus her initial contact was on the shorter side). 1. They had been in touch for about two months- they had talked marriage but not to the point where she was expecting a proposition. Rather, she had thought that this guy was serious about exploring marriage. 2. She did not think it was a matter of attraction- I misinterpreted her when I thought that. 3. She had wanted to meet much sooner, but he had delayed a meeting. 4. She had done some basic background inquiry, and it seemed to back up that he was in fact a real person. I came across this passage during my review of the Old Testament. It drew my attention because of the language at the end- that of an everlasting covenant, and the people Israel not being removed from the land. It occurred to me that the prophet Baruch here was presaging the new Covenant of Jesus, and the New Israel in the form of the Church. He surely wasn’t speaking of the descendants of Judah, or at least them alone and in total, given how many didn’t reform their lives. 13 For you were called to freedom, brethren; only do not use your freedom as an opportunity for the flesh, but through love be servants of one another. 14 For the whole law is fulfilled in one word, “You shall love your neighbor as yourself.” 15 But if you bite and devour one another take heed that you are not consumed by one another. 25 If we live by the Spirit, let us also walk by the Spirit. 26 Let us have no self-conceit, no provoking of one another, no envy of one another. We all face this choice. Whether or not we recognize it, we are given ample opportunity to serve either master. Given the consequences which will result from this choice, we would all do well to choose wisely. Birinus (c. 600 – 649), venerated as a saint, was the first Bishop of Dorchester, and the “Apostle to the West Saxons” for his conversion of the Kingdom of Wessex to Christianity. The source of this was his wiki, located here. Today’s post is a short one, owing to a lack of time and imagination on my part. There are a few posts around the ‘sphere that I want to comment on or highlight for my readers. Government simply is authoritative discrimination in favor of one alternative instead of others. Worth a read, especially for those with a political bent. Deep Strength has a couple of posts up that are interesting. His most recent covers his first meeting with “her father.” I think it is well worth the read, especially for those single men looking to marry among my readers. He made a number of unforced errors, and hopefully others can learn from his experiences. Like some of the other readers, I thought that the father’s actions were also doubtful at parts. At the same time, it is evident that he truly cares about his daughter, which is a rarity these days. I think it is worth pointing out that the father may not have any prior support to help him in his own vetting process. Christian fathers are often as bereft of knowledge these days as young Christian men looking to marry. Past generations dropped the ball for everyone. Additionally, Deep Strength examined the matter of vetting and the risk of divorce. Lots of good analysis there. I want to take a stab at answering the questions that Deep Strength posed at the end of the post. In particular, I want to offer an additional theory: the “Feminine Mystique.” Women like to maintain the air that the female of the species is ultimately unknowable. In the context of DS’s post that means unpredictable. I know Rollo has a post or two on the subject, but as I see it women like to keep men in the dark about how they really are as it benefits them for men (or most of them) to be ignorant. Ignorant men cannot catch on to strategies like AF/BB, for example. Also, it helps women filter for male attractiveness- those rare men who do “get them” are more likely to be successful with women, and thus probably superior genetic stock. There are probably other reasons, but I think I’ve established enough for what it is. It is also worth mentioning that much of it might be unconscious on the part of women- almost reflexive, as it were. But not all, of course. Cane Caldo has made some dramatic life choices recently. The first post is here. The second is here, and the third here. A point he brings up is that patriarchy, as far as daughters are concerned, is heavily focused on protecting and guarding them. The same can be said of sons as well, in an indirect fashion. By ensuring that women are raised right, fathers in a patriarchy can ensure that their sons have access to decent pool of marriageable women. Without the protection of Patriarchy, such a pool will dry up quickly. See the present day for reference. Zippy is back, at least for one post. Once again he covers the lies inherent in a democratic form of government. What surprised me is that he predicts our present system has as many as 50 years left in it. I wouldn’t have given it that long, but unfortunately he might be right. Ours has proven to be a surprisingly robust socio-political system, and inertia can have a profound effect. Finally, congratulations are in order to blogger Chad, who became recently engaged to the young woman he has been courting for some time.